Work is due to start on the relocation of the Dobson & Crowther print works. J-Ross Developments Ltd, part of The Pickstock Group of companies, based in Oswestry, is due to start work on the delivery of a new print works for Dobson and Crowther Ltd this month, which is part of the first phase of development that must be complete before work may start on a new Sainsbury’s Food store. The development proposals form part of two planning permissions approved by Denbighshire Council in December 2012, which provided for local employer Dobson and Crowther Ltd to be relocated to a new purpose built facility at Climedw a designated employment site on the outskirts of Llangollen and the subsequent construction of a new food store and car park for Sainsbury’s on the existing print works site. 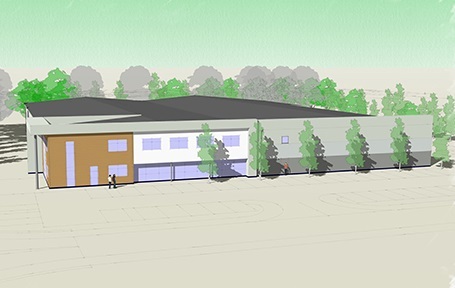 Pickstock Construction, an associated construction company, within The Pickstock Group, are due to commence construction works at Cilmedw on the new Dobson & Crowther print works this month. It is anticipated that the first phase will take around 7 months to complete and that the construction on the new food store site will start in the second half of the year, once Dobson and Crowther have decanted into their new premises. J-Ross Developments ltd has worked closely with Dobson and Crowther on the design of their new 4,180sq.m. (45,000 sq.ft.) purpose built factory. The development represents a significant investment for Dobson and Crowther, who with approximately 100 employees is Llangollen’s largest employer, allowing their current operations to be modernised, achieving improved efficiencies which will ensure that they remain competitive in their market and helping to support the future of their business. Paul Holden of Dobson and Crowther said “The workforce are thrilled by the prospects of moving into a brand new factory and the benefits this will bring to the business. We are all looking forward to a busy but exciting year”. Once complete the new 3,205sq.m. (34,500sq.ft.) Sainsbury’s store will occupy Dobson and Crowther’s old site and will create around 130 new jobs, providing a major economic boost for the area, allowing local people to carry out their main food shop locally rather than travel out of town. Access will be improved from the A5 to accommodate the traffic movements, and a link with the footpath along the riverside will be developed to provide a safe and convenient pedestrian route to the town centre. Ken Skates, the Welsh Assembly Member for Clwyd South, said “I have been a strong supporter of this project from the start and welcome this investment in the region and hope it will be the start of brighter things to come for Llangollen and the Dee Valley after the toughest recession we have seen for a generation.” Another ambassador for the development, Llangollen Councillor Stuart Davies commented “I am very pleased to see the plans coming to fruition. I fully supported this development at the planning committee realising that it was going to safeguard existing jobs and create new ones”.